I was in Philadelphia for business this week, so I took it upon myself to explore the local culinary scene. By far, the singular gastronomic experience of my trip was visiting Marigold Kitchen. Marigold Kitchen is located in a beautiful Victorian home, where the chef (who trained at Alinea, among other spots) also lives. It was a 15 minute or so ride from my hotel in City Center, but very much worth the journey. 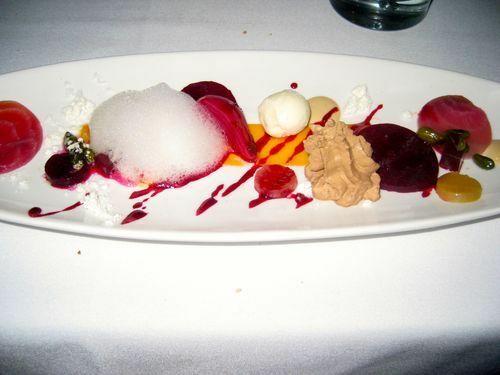 Marigold Kitchen, as one may infer from the chef’s internship at Alinea, focuses on molecular gastronomy. The fusion of art, science and food meld together to create a remarkable experience for the guest. Although social media had somewhat spoiled me to some of the more Instagram-worthy dishes (such as liquid nitrogen truffle popcorn), it was still exciting to see what would emerge next from the kitchen. I particularly appreciated how the restaurant was able to curate the night’s menu to adapt to my vegetarianism, as many tasting menus don’t offer this option. However, I found the vegetarian entree (baked quinoa with miso eggplant, roasted cauliflower and a lemon-tahini glaze) to be the most unimpressive course, managing to be dry in both presentation and flavor. The entree was less savory and innovative than two of the prior exemplary courses, the single ravioli filled with liquid butternut squash and covered with banana salt (which had to be eaten in 1 bite), and the superb beet salad which was served on a long plate dotted with various gelees, foams and mounds containing orange, pistachio, balsamic, port, lavender and sheep’s milk ice cream. Delving into the beet salad’s various elements was like a Choose Your Own Adventure game for the palate, never knowing which pleasant flavor would emerge next. Desserts were equally delightful, from the chestnut macaroon which ended the meal, to the whimsical follies, particularly the cream-filled “push-pop”. 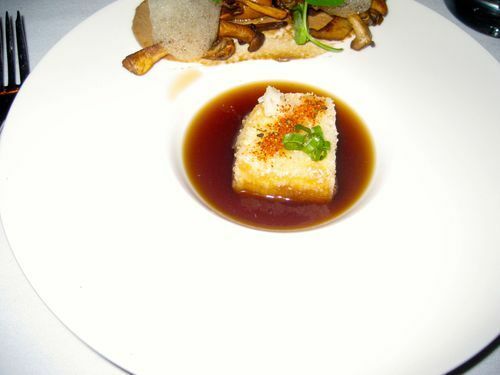 However, my favorite course had to be the white bean bisque, hidden below a frothing layer of thyme flavored bubbles. The soup was excellent, and I gladly would have consumed an entire bowl of it as my entree, had that been an option. The airy thyme bubbles were an unexpected addition to the soup’s succulence, both in texture and in flavor compliment. My server advised me that this course could be “taken like a shot”, or “sipped” and I opted for the latter, happy to prolong the experience however slightly. The staff at Marigold Kitchen was wonderful, from both coordinating my vegetarian menu to taking the time to talk with me and make me feel less awkward, as I was the only solo diner in the entire restaurant. The creative food and cozy ambiance lend themselves to festive occasions from birthday parties to anniversaries, and as a business traveler, I appeared to be the only guest not celebrating a memorable event. Without being annoying or cloying, my server managed to make me feel comfortable by chatting with me about my interests, where I was from and the architecture of the restaurant. Although I would recommend visiting Marigold Kitchen with a group of friends due to the convivial environment and discussion-worthy cuisine, a lone business traveler will be made to feel welcomed and at ease by the staff. I look forward to returning to Marigold Kitchen in a more social setting, as it is an excellent location for a meeting of both the minds and mouths. That said, its strength derives more from the latter, through unique blends of texture, taste and presentation which challenge conventions of food as we typically experience it.